"Must See's" & "Should See's"
+ Scenic Fall Vacation Road Trips & "Reviews"
This page is a listing of our New Hampshire Attraction "Must See's" and "Should See's"
Have a Favorite "Must See" New Hampshire Fall Attraction, Day Trip, Scenic Drive, or Place? "Rave" or Share it with our Site Visitors on the easy fill-in form below. Franconia Notch State Park - North 6 miles from North Woodstock, NH on I-93 where road turns into Franconia Notch Parkway for approximately 8 miles. Hwy 3 crosses through area. Between tall Kinsman and Franconia mountain ranges - spectacular scenery. Flume Gorge is in this area, along with what is left of the "Old Man of the Mountain" rock formation above Profile Lake. Many scenic viewing spots. This link goes to much information on NH Franconia Notch State Park at the NH State Parks web site.
. Flume Gorge - in Franconia Notch State Park above. Vertical walls on sides rise up to 90 feet above the Gorge floor. Walk along a boardwalk through the gorge, then can walk a nature trail through the woods. The Flume Gorge and Franconia Notch State Park are a "Must See" New Hampshire Attraction. Mount Washington Cog Railway - Originates approximately 6 miles northwest and 6 east from the Mt Washington Hotel - noisy and very scenic trip to the top on some very steep incline track - up to 37% incline. At some points on the trip up the people in the front of the passenger car are 14 feet above those in the back. Interesting working Cog Rail Road that you may luck out and get to see arrive at top of Mt Washington. (See picture at top of pg) Old cog engine comes noisily chugging up steep incline spewing smoke and tooting its whistle. Share your own New Hampshire Attraction Favorite below! + see the "Must See's" Other Site Viewers have shared. Notice special angled Boiler Chamber on steam powered Cog RR Engine if it arrives when you are there. 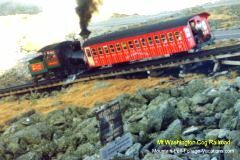 This link goes to a comprehensive page of Info about the Mt Washington Cog Railway New Hampshire Attraction. 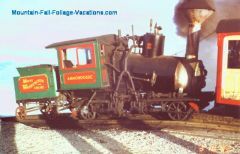 Or see this link for more pictures + ticket Info and phone numbers for the Cog Railway and the Cog Ski Trains. Board Cog railroad for a scenic ride to the top of Mt Washington about 6 miles northwest and 6 east of the Mt Washington Hotel above. Great views on the ride up and at the top. Cannon Mountain Aerial Tramway - from Valley Station to the top of Cannon Mountain. Approximately 6 miles north of The Flume off of Hwy 3. Southeast of town of Franconia. Two 80 passenger cars take you to the top of 4,200 foot summet for spetactular views of the White Mountains, Maine, Vermont, and on a clear day, even Canada. Can walk summit walking paths and see other New Hampshire fall foliage viewing scenic points. Fun New Hampshire Attraction. See this link for more Info on the Cannon Mountain Aerial Tramway Schedule & Prices. Open from late May to mid October. Crawford Notch - Runs along Hwy 302 and the Saco River from near town of Bartlett on south to a few miles south of Bretton Woods, NH on north. Notch was formed by an ice sheet pushing through pass between two steep well-forested mountains. Crawford Notch State Park includes most of the notch area. Silver and Flume Cascades are toward north end of the Crawford Notch and are waterfalls worth stopping to view. Crawford Notch is a great "leaf peeping" inclusion in any New Hampshire Fall Foliage Vacation Day Trip. The "Must See" Mt Washington Hotel is just north of the Crawford Notch area and the entrance to the Mt Washington Auto road is about 25 miles to the northeast. This link goes to a New Hampshire Park Service web page on Crawford Notch with more Info and pictures. Beautiful and Lavish 200 room Historic Resort Hotel - opened in 1902. Where wealthy families spent their summers in New Hampshire and the New Hampshire White Mountains. See more Info and pictures of the Mount Washington Hotel on our New Hampshire Mt Washington Hotel page plus a Mt Washington Resort Hotel link with several pictures of the Resort Hotel and surrounding spectacular mountain views. Can catch Cog railroad ride to top of Mt Washington about 6 miles northwest and 6 east from the Hotel on a well marked road. A "Must See" New Hampshire Attraction. See our New White Mountains Resort Top Picks Page - "Reviewed" North Conway & Lincoln Vacation Resorts + Amenities & Nearby Activities. Mt Washington Auto Road - Near Gorham, NH - Highest peak in New Hampshire - 6,288 feet. Panorama views of several states and Canada. Beautiful Mountain Fall Foliage views! Very narrow road to top with no fences along straight down mountain drops at edges. Can also take guided Van tour up and back -- or Cog Railway below. Take a jacket - Average temperature at the top of Mount Washington is 27 degrees and average wind speed is 35 mph. This link goes to a comprehensive web site on everything about Mount Washington with much information and more pictures on the Mt. Washington Auto Road in the New Hampshire White Mountains. Another "Must See" New Hampshire Attraction. More Mt Washington Auto Road Info, a Picture, and a Mt Washington Mountain Web Site Link are on our New England Fall Foliage "Must See's" page. Scenic 35 mile drive across the Kancamagus Highway (#112) mountain road between Conway and Lincoln NH in the White Mountain National Forest. We have always seen spectacular New England Fall Foliage colors on this Fall road trip! Much of the drive follows the Swift River Valley and then over the 2,860 foot Kancamagus Pass. There are many scenic overlooks, picnic areas, and campgrounds. The Lincoln Woods Visitor Center is about 5 miles east of Lincoln and has much helpful Info on the area. This Fall Foliage New Hampshire Attraction is worth driving twice - one way near the beginning of your New Hampshire Fall Foliage Vacation, and once the other way toward the end of your NH Fall Vacation visit to see the Mountain Fall Foliage Color changes since your first trip. This link goes to Kancamagus Hwy area Info. To a Printable Map of Kancamagus Hwy #112 from Conway to Lincoln + surrounding area with some New Hampshire Attraction locations and Resorts marked. Scroll down on the "Teardrop" list on left to see more Info + User Reviews of the Attractions - or check them out on this NH Attractions page! Definately recommend taking the Kancamangus Hwy Scenic Drive! More Kancamagus Highway Info, a Picture, and a USDA White Mountains National Forest Link are on our New England Fall Foliage "Must See's" page. On East side of Lake Winnipesaukee. Beautiful drive up to top of "mountain." Stop and do the walk up to the waterfall area. The Castle has panoramic views in every direction including great views of Lake Winnipesaukee and the surrounting mountain peaks. Beautiful Castle and grounds. 45 miles of scenic hiking trails. The Castle in the Clouds had modern plumbing and conveniences not usually found in homes built at that time. Many interesting Antiques. Guided Tours are available on some dates, and recommended. A definate "Must See" New Hampshire Attraction!!! Tip -- Walk the scenic 4-5 minute walk back down from the Castle to the Restaurant and Parking area Vs taking the Trolly back down from the Castle. There are some great views and photo opportunities on the walk down! More Castle in the Clouds Info, a Picture, and two Castle in the Clouds Info and Pictures Links are on our New England Fall Foliage "Must See's" page. Loon Center & Markus Wildlife Sanctuary - 1 Mi. SW of junction of Blake Road and SR 25 - 1 Mile SW on Blake Road, then south on Lee's Mills road - Moultonborough, NH. In Castle in the Clouds area, above. Everything about the interesting and unusual Loons featured in the "On Golden Pond" boat tour below. Exhibits, Videos, and Hiking trails. Allow 2 hours. Free will donations. This link goes to a page of information about the Loon Center and Markus Wildlife Sanctuary with links to open times, nature trail Info., and some pictures. In Kinsman Notch area. Lost River winds through some boulder caves and "potholes" up to 25 feet across and 60 feet deep. River becomes Paradise Falls at the foot of the gorge. Self guided tours - also can take trips through caverns. Picnic facilities and food is available. Allow 1 1/2 hours. Nearby Lost River Nature Garden has flowering plants in bloom June thru September. This link goes to a web site with additional tour information and some pictures of Lost River Gorge and Boulder Caves Park. A New Hampshire Attraction fun for the whole family. Squam Lake "On Golden Pond" boat tour - departs from bridge in downtown Holderness - On Hwy 3 & 25 NW of Lake Winnipesaukee. Movie "On Golden Pond" was filmed at Squam Lake. Discover history and scenery of Squam Lake. You will probably see several Loons plus House & area where the movie was filmed. Will also hear interesting story of how movie was made in 1981. This link goes to a page of information about the "On Golden Pond" Boat Tours with times and some pictures. Interesting New Hampshire Attraction - especially for those that have seen the movie. Several 1 and 2 hour scenic cruises of Lake Winnipesaukee available on 1,250 passenger and a smaller excursion ship. Peaceful and enjoyable to see the scenery and Fall Foliage from an "On-the-lake" perspective. Can do also Sunset and Evening Dinner Cruises. This link goes to the MS Mount Washington Web Site with detailed Info on the various Lake Winnipesaukee cruises available with times, prices, and contact Info. Peaceful New Hampshire Attraction. Canterbury Shaker Villiage - off of I-93 approximately 12 miles south of Franklin, New Hampshire exit # 18. Canterbury was one of early important US Shaker religious colonies - established in 1792. Twenty-five of original buildings have been restored. Guided tours are available. Allow at least 2 1/2 hours for this New Hampshire Attraction. "Rave" or Tell our Visitors about it below! You can also view the Top "Must See's" or "Raves"
If your Favorite "Must See" is on the List above, please add your thoughts about your Favorite below. Rave -- or just talk -- a little about your personal Top "Must See" so others will know how great it really is and not miss seeing it! Do you have a Favorite New Hampshire Mountains Fall Vacation "Must See"? Share it with the viewers to this page + your Tips! Your New Hampshire Fall Vacation Favorite "Must See" story will appear on a Web page almost exactly the way you enter it here. You can wrap a word in square brackets to make it appear bold. For example [my story] would show as my story on the Web page containing your story. TIP: Since most people scan Web pages, include your best thoughts in your first paragraph. Include your favorite thoughts + Tips about your Top Pick Attraction, Scenic Drive, Day Trip, or Place that might help our Viewers. Our Viewers Best New England Fall Vacation Stories - Where they Stayed, Played, Drove, and Dined. "Raves" & Reviews from our Site Viewers. Share your own Best New England Fall Vacation! You could even be a Winner in our New Site "Top Raves, Rants, & Reviews" Contest! Please send us any Comments or Suggestions you might have regarding New Hampshire Fall Foliage Vacations to us on our Comments, Suggestion, & Favorites Form. If you have any personal New Hampshire Attraction Favorites or Pictures you would like to share, please send them using our Comments Form. To Mountain Fall Foliage Vacations Home Page - Affordable New England Fall Foliage Vacations - Including Pennsylvania Pocono Mountain Vacations, Maine Fall Foliage Vacations (to come), and New Hampshire Fall Foliage Vacations + New Hampshire Attraction "Reviews." To Top of this page - New Hampshire Attraction "Should See's" and "Must See's" - New Hampshire Fall Foliage Vacation Attractions and Colorful Fall Foliage Viewing Drives, Scenic Points of Interest, "Must See" Ski Vacation Day Trips + White Mountain New Hampshire Attraction list.